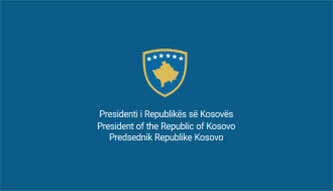 It is my honor to be before you today on behalf of the institutions and the people of the Republic of Kosovo. I want to thank the United Nations and the Security council for their continued attention on Kosovo and the developments in the region. I will never forget that during the darkest days for myself and the citizens of Kosovo, it was from this chamber that voices of hope and calls for peace echoed. Myself and my people will never forget that when we were facing our toughest moments, you became our voice. We thank you eternally. Thanks to you, the world learned of the systematic violence, ethnic cleansing, the thousands of innocent citizens that are no longer amongst us, thousands more that are still missing, and over 20.000 women that continue to live with the pain and the stigma of the sexual violence that they experienced during the war with Serbia. You were our voice, when we did not have one. Today we are here two decades after the body war, and ten years after the independence of Kosovo. We have been summoned for an extraordinary session, during a time of complete normality and substantial progress in Kosovo. When the degree of engagement of the United Nations mission in Kosovo demands a serious review and when your attention is required to address real problems facing the world. Nothing extraordinary happened in Kosovo last week. In fact, what happened is a normal decision, just in its mission and purpose. 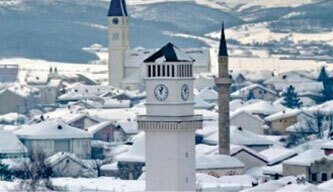 If Kosovo has made a mistake, it has done so in unnecessarily waiting for ?ve years to establish its Army. The decision for the army may be belated, but it is in no way a wrong one. It is belated because we waited for goodwill from those that did not show us any until today, not in relation to the state of Kosovo. However now, the Republic of Kosovo, as a sovereign and independent state, has undertaken a natural step for the establishment of its army. Please do tell me what is extraordinary about this? There is nothing extraordinary about this, and there is nothing, nothing whatsoever that contradicts resolution 1244, President Ahtisari’s package, the constitution of Kosovo, or international law. First and foremost, resolution 1244, respectively paragraph 15, refers only to the demilitarization of the KLA, a process which was completed in record time and without any incidents. It was highly appreciated even from the Security Council and then Secretary Ko? Annan. It was also highly valued from NATO, and this is a fact that is strongly supported from evidence and existing NATO and UNMIK reports of the time. Secondly, President Ahtisari’s comprehensive package, who was the special representative of the UN General Secretary for negotiations regarding the ?nal status of Kosovo, in 52 clearly underscores the right of Kosovo to have an army. Moreover, the Strategic Review of the Security Sector, undertaken in close cooperation with NATO, emphasizes very clearly the right of Kosovo to transform its Security Force into Armed Forces. Finally, and most importantly, the decision of the International Court of Justice, which might I add was made upon Serbia’s request, communicates in a crystal clear terms that Kosovo did not violate any international laws when it declared its independence. As such, that it is Kosovo’s indisputable right to have its army. The establishment of the army is the will of the people of Kosovo with unanimous political from the chosen representatives of the people. Regardless of whether some may like that or not. The Serbian state expressed its agravation. But the Serbian citizens of Kosovo have not. Allow me ladies in gentlemen, in my capacity as the President of the Republic of Kosovo and as Commander in Chief to clearly state that Kosovo’s armed forces will produce more peace and stability. The transformation of the mission of KSF is not a step which we have undertaken as a message against anyone. Kosovo’s army is not, and will never be a threat to anyone. Kosovo’s army is and will remain a professional and multiethnic force. Over 10% of the soldiers are from non-majority communities. Serbians, Montenegrins, Croats, Turks, Bosniaks, Romans, Egyptians, Ashkali etc. A force that will protect every citizen of Kosovo, every child, every youngster, regardless of the language that they speak at home. NATO members as heroes. They still hand them out ?owers. And they will be grateful to them forever. I am proud to be the President of the most pro-NATO and pro-EU country in the world. Despite the dif?culties, and despite the injustices that are being done to us, especially in the visa liberalization process, we as a country stand unshaken in our orientation. We do not have and we do not seek another alternative, another path. 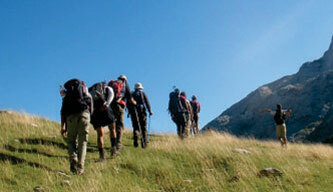 Kosovo’s future and the future of our region is within the Euro-Atlantic structures. Thus, honored attendees, this unavoidably leads us to the essence of today’s debate. The problem that our northern neighbor has today is not Kosovo’s army, but rather the existence of Kosovo itself as an independent and sovereign state. These circumstances make the dialogue between our two countries crucial. Without a dialog and without a ?nal agreement, we will become countries that produce endless and unnecessary drama for domestic consumption. To the detriment of the future of our countries. 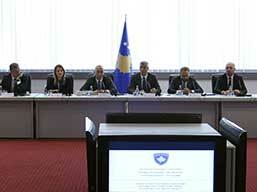 I implore you to take a look at the abhorrent campaign that Serbia lead against Kosovo’s bid for INTERPOL membership. Tell me please who stands to bene?t from Kosovo’s lack of membership in this organization? It is organized crime that bene?ts. It is terrorism. Would you say that I should denigrate this forum now by using the language and methods employed by Serbia against Kosovo?. To be frank, I sincerely feel bad for their behavior. It is only natural that such behavior be followed by measures from the Government of Kosovo on Serbian products that come into Kosovo. So, Kosovo has not provoked this situation. This reaction is a consequence of aggressive action by Serbia. I want to believe that this state of affairs will be overcome in the near future. Prishtina and Brussels are communicating intensively about this issue. Nevertheless, in Kosovo, we remain committed to peace and dialogue with Serbia. To this end, a few days ago the Assembly of Kosovo approved the resolution for dialog and the structure of the negotiating team including governing and opposition parties, and civil society. For as long as we do not have a ?nal and enforceable agreement, situations of this kind will be repeated continuously. 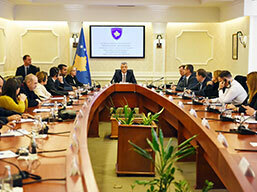 Myself and the people of Kosovo do not support con?ict. In fact, we have never in our history been the of instigators any con?ict. We have always been the victims. Always forced to ?ght for survival. Peace does not imply the lack of all disagreements, but this cycle of violence is unjusti?able and must come to an end. To democratic societies the use of force means monolog, not dialog. Thus, it is the duty of my generation leave behind a region without outstanding con?icts, a region in sustainable peace. A functional Balkans in which Kosovo and Serbia, as two independent nations, aspire for a European future. I know all to well that peace building is much more challenging than war. However, peace is our duty to our children. To the generations to come. We owe to them a future without con?ict. Kosovo is ready. We are ready for dialog. We are ready for tough decisions. However, we are simultaneously aware that if we do not seize this historic moment, then all involved parties will suffer the consequences. Honored attendees, Two decades ago, on a mundane day much like this one, I was in uniform, ?ghting against the regime of Slobodan Milosevic. I am immensely proud of my own past and that of my fellow ?ghters. Today, as President of the independent state of Kosovo, I am aware that I have another momentous challenge before me. The battle for our future. The battle for peace. The battle to close a century-old con?ict between our two peoples. I know that it will not be easy at all. I know that agreements of this kind are not very popular. However, the remain necessary. I ?rmly believe that an agreement like this will have transformative power throughout our region. Such an agreement would shift the priorities of our people. No one would be able to win votes founded on hate. No one would be able to materialize fear. A comprehensive agreement would open the doors for new leadership, the primary aim of which will be development. I truly believe in a future where Kosovo and Serbia will sit as equals on the table of the European family. I believe in a future where Kosovo and Serbia’s soldiers serve alongside one another in peacekeeping missions around the world. I believe in such a future, because I have experienced the impossible, the impossible unfolded before my own eyes. Every day I am inspired by Kosovar athletes who teach us that comeback is possible after defeat, that our ?ag can one day ?y even in countries that have not yet recognized our country. I am inspired by the journalists who keep me honest, and make me a better President for my country. I am inspired by the citizens of Kosovo who despite all the pain, the suffering, and the loss that they have endured, never gave up on the values and principles that still stand, liberty, equality, justice, and dignity. believe in a European future for Kosovo and our region. In a future without intrigue, con?ict, or hatred. 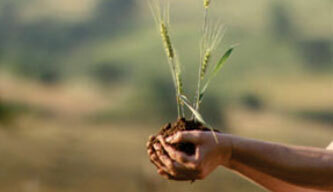 It is in our hands to actualize this future. Soon, in the upcoming weeks and months. With a peaceful agreement between Kosovo and Serbia, a legal binding one, without ethnically based borders, without population exchange, but rather with reciprocal recognition as independent and sovereign countries with multi-ethnic societies.